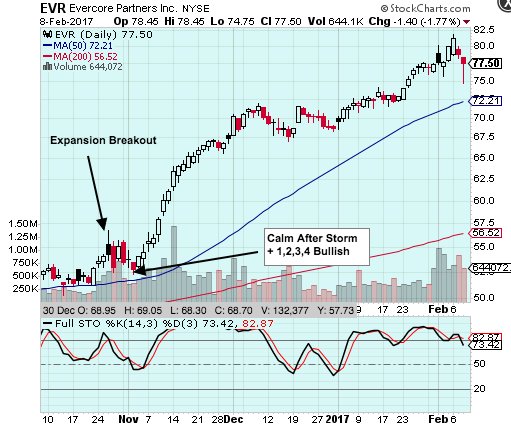 The other day I was flipping through charts on the top percentage gainers scan and noticed the run EVR has had over the last three months. It's pretty much been straight up (more than 40%) since late October. They're too expensive. Real-time quotes cost a lot of money if you want to republish them on a website. They aren't necessary for swing or position traders. That second point is what I want to drill down into. IMHO, one of the key benefits of swing trading is that you don't have to watch the market all day long. It's an approach to the market that makes sense for most people, who aren't trading full-time. I've written about how I use the site to find trading candidates but now I'll detail how I manage my trades. My goal here is to get the computer(s) to do the bulk of the trade management. Computers are great at always being on (hopefully); following directions/rules; not being emotional; not hesitating; doing things quickly & precisely. I want to take advantage of all of those traits. Just as an example, I'll choose a stock which made a hammer candlestick yesterday -- SKT. I'll typically enter a (buy/long) trade a few cents above the previous day's high and put a stop loss order at or just below the previous day's low. SKT's high & low yesterday were 40.47 and 40.04. I want to see that SKT is moving in 'my' direction before entering a trade so I'm not going to try to buy it until it clears 40.50. I'll do that by using a buy stop limit order with a stop loss attached to it. The 'buy stop limit' tells my broker's computers to watch SKT and enter a LIMIT order if and only if SKT trades at or above the STOP price. I'm going to enter this order with a STOP price of 40.51 and a LIMIT price of 40.60. I'll put my STOP LOSS order at 39.95. That's the entry form for my broker -- Interactive Brokers. Stepping through the order entry form from left to right and top to bottom... 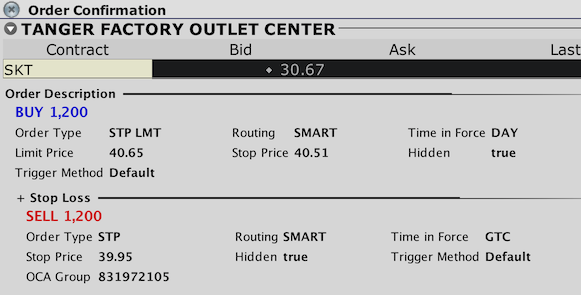 I chose to BUY 1,200 shares (QTY) with an order type of STOP LIMIT (STP LMT) with a LIMIT price of 40.65 and a STOP price of 40.51. The order will stay "in force" for the day (meaning it will only exist in my broker's system for the NEXT trading day if I entered the order while the market was closed or the CURRENT day if I entered the order while the market was open). You'll also see that I clicked the "advanced" button, which opened an additional form. That's where I attached a STOP LOSS order. That order will only go live if the attached buy order gets executed. 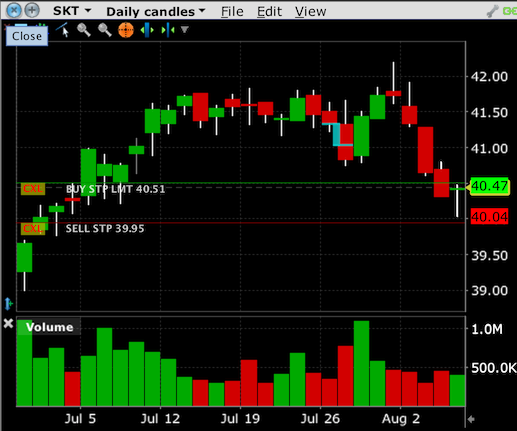 The stop loss order will then be set to trigger a sell (at market price) order if SKT drops to 39.95. Note that the stop loss has GTC (good til canceled) for its time in force. I want the stop loss order to stay active day after day for as long as I'm in the position. And here's a visual representation of the order on the SKT chart. The green line shows where the order goes live -- note the label: 'BUY STP LMT 40.51'. The red line shows where the stop loss will trigger -- note its label: 'SELL STP 39.95'. I always check for these lines on the chart to get a nice visual confirmation of what my order will do. I typically want to see the last day's bar/candlestick bracketed by my entry and exit orders. So I go to the "Conditional Orders" page and choose a "One-Triggers-All" order type. For a "One-Triggers-All" order, once the first order executes, the attached order(s) get entered. 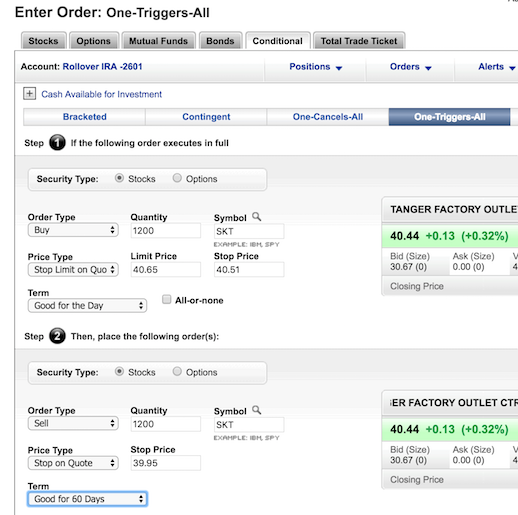 You can also do some interesting things with eTrade's bracketed orders (trailing stops or profit takers) and contingent orders. Orders like that allow me to NOT have to watch the market at all during the trading session. I know that my entry order will get executed if the stock hits my entry trigger price and I'll be protected with my stop loss order. What I don't know, though, is if my order will be filled. Because I'm using a LIMIT order to enter the trade it's possible that the order will not be filled or will only be partially filled. That will happen if the stock moves past my limit price too quickly for my order to get executed. I try to prevent that from happening by only trading liquid stocks and by having at a reasonable distance between my BUY STOP PRICE and the LIMIT price. If you've added stocks to your portfolio on SwingTradeBot, you've seen that there's a place to enter your chandelier exit parameters. I typically set my Chandelier Exits to 3 ATRs. Each night when the Bot updates its data and processes alerts, it also recalculates the Chandelier Exit values. So part of my after-market process is to check if I need to adjust my stop loss orders to match their current Chandelier Exit values. So that's my process for managing trades. It doesn't require me to pay any attention to the market during the trading day. So I can work my day job, be on vacation, be offline, be asleep, etc. and my orders will get executed. This process has worked really well for me over the last few years and I can't imagine going back to staring at quotes & charts all day like I used to do years ago. If and when I do need a real-time quote I simply use by broker's smartphone app.